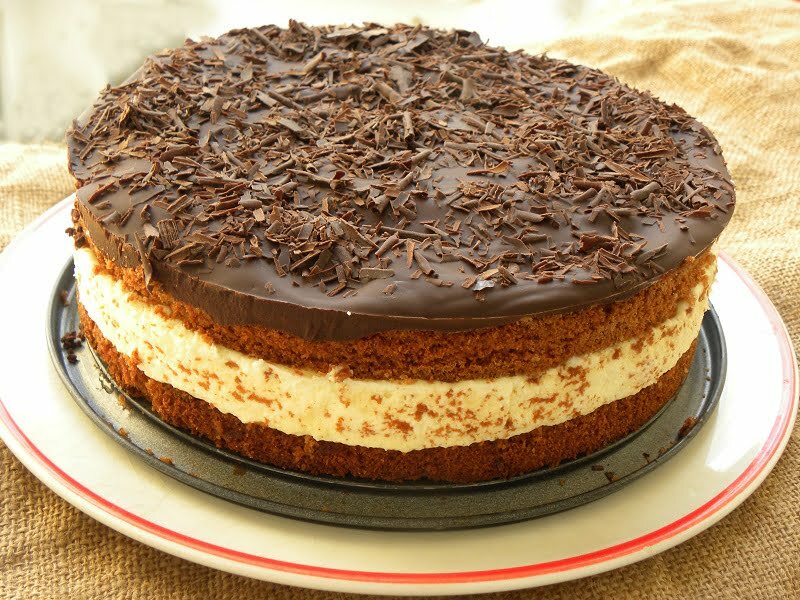 Bountry Cake is a luscious cake which mimics the chocolate bars as it is filled with coconut cream and topped with chocolate! The base is an easy cake recipe which was based on my Marbled Chocolate Bergamot Cake but with a few tweaks and without the marbled effect. This cake was made my daughter and although she was originally planning to make my Sponge Cake as a base, some egg yolk dropped in the egg white, so she did not manage to make the meringue. She salvaged the cake by following my instructions and making it into a simple cake. She added some drinking chocolate, since the only chocolate she had at home was that but if you want a regular yellow cake, you can leave it out. She made it for her brothers’ name day, on Friday the 29th September. We also wanted to be there to celebrate with them but also to see our eldest son, who was coming from Cyprus on the 1st October, for a one day visit to get some documents he need for his new job in Germany. so we arrived in Athens on the previous day. Scroll down for the video with the filling! The cake was so delicious that we devoured it in two days before our eldest son arrived, so I asked my daughter to make this one again. The filling was a creation of my daughter. She once made some chocolates filled with coconut so she adjusted that recipe by adding cream cheese and whipped cream to the filling as well. The second time, instead of using margarine, we used butter but either way, the sponge is delicious! I know that this Bounty Cake is going to become one of our family’s favourite as we all love chocolate and coconut! If the idea of being able to bake sounds tempting but a little scary, this is the perfect cake for you. It’s infinitely variable and incredibly easy to make. We used a hand mixer but if you don’t have one, simply place all the ingredients in a bowl and beat until combined. You can mix with a wooden spoon, a balloon whisk or even by using the pulse action of a food processor. The meringue is not absolutely necessary, but it does add volume and lightness to the cake making it light and fluffy. Butter or margarine? Butter definitely makes everything taste better but using margarine, rather than butter, also works really well for this cake and saves you some extra time for the butter to soften. So, plan ahead! Don’t be tempted to open the oven before 40 minutes – you’ll regret it! Your cake will deflate! You can prepare the cake a couple of days before. Put it in an airtight container or wrap it with cling film. If the filling and glaze are too complicated for you to make, just fill the cake with jam or just sprinkle some icing sugar on top! Prepare the cake: Preheat the oven to 180C/ 350 F and place rack in the centre of the oven. Line a 24 cm spring form cake pan with parchment paper and grease and dust the sides of the pan with flour. Combine the flour, corn flour, drinking chocolate, baking powder, baking soda and pass them from a sieve. Add the salt and orange zest and mix.Whisk the egg whites with a pinch of salt until a stiff meringue is achieved. In the bowl of your electric mixer beat the butter with sugar until light and fluffy. Add the eggs, one at a time, until incorporated. Add the milk and vanilla and mix. Scrape the sides of the mixer bowl, whenever needed. The batter may look curdled but don’t worry. Lower mixer speed and gradually add the flour mixture. Using a spatula gently fold in the meringue, until no egg whites are visible. Empty the mixture in the baking tin. Smooth the surface with the spatula and tap the pan a couple of times. Bake the cake for about 50 – 55 minutes, depending on your oven. After the 40 minutes check with a knife inserted into the centre until it comes out clean. Place onto a cooling rack and leave to cool before removing it from the baking tin. Prepare the syrup:Put the sugar and water in a small pot and put it on the heat. Stir until the sugar dissolves and cook it for 5 minutes. Add the limoncello and mix. Set aside to cool and wet both pieces of cake. If the top of the cake is too rounded, cut a slice with a serrated knife to make it flat. Divide the cake into two equal pieces. Put half of the cake back in the baking tin and put the ring around it. Wet both pieces with half of the syrup. Prepare the Filling: Put all the filling ingredients in a small pot and mix to incorporate. Put it on the heat and mix until the sugar melts and becomes a thick paste. Set aside to cool or use a cold bath with ice cubes until it cools. Whip the heavy cream until peaks form. Add the coconut paste, cream cheese and vanilla and mix to incorporate. Refrigerate until ready to use. Pour the cream and cover with the second piece of cake. Refrigerate until ready to use. Prepare the glaze: Cut the chocolate into smaller pieces and put it in a microwave safe bowl. Add the butter and heat at 640 w for one minute. Mix and heat for another minute or until the chocolate melts. Add the cream and 1 tbsp syrup and mix to incorporate. Pour over the cake and sprinkle with some chocolate shavings. Refrigerate for a couple of hours before removing the ring. Preheat the oven to 180C/ 350 F and place rack in the centre of the oven. Line a 24 cm spring form cake pan with parchment paper and grease and dust the sides of the pan with flour. Combine the flour, corn flour, drinking chocolate, baking powder, baking soda and pass them from a sieve. Add the salt and orange zest and mix. Whisk the egg whites with a pinch of salt until a stiff meringue is achieved. In the bowl of your electric mixer beat the butter with sugar until light and fluffy. Add the eggs, one at a time, until incorporated. Add the milk and vanilla and mix. Bake the cake for about 50 - 55 minutes, depending on your oven. After the 45 minutes check with a knife inserted into the centre until it comes out clean. Prepare the syrup. Put the sugar and water in a small pot and put it on the heat. Stir until the sugar dissolves and cook it for 5 minutes. Add the limoncello and mix. Set aside to cool and wet both pieces of cake. Put all the filling ingredients in a small pot and mix to incorporate. Put it on the heat and mix until the sugar melts and becomes a thick paste. Set aside to cool or use a cold bath with ice cubes until it cools. Cut the chocolate into smaller pieces and put it in a microwave safe bowl. Add the butter and heat at 640 w for one minute. Mix and heat for another minute or until the chocolate melts. Add the cream and 1 tbsp syrup and mix to incorporate.